The song Assassin by Muse has to contain one of the greatest drum performances ever recorded by Dominic Howard. He really pulls out all the stops on this tune with a monster groove during the chorus, a head nodding groove during the verse and bridge and then THAT drum fill that occurs at 0:29 into the song. I’m going to show you how to play the triplet drum fill in question. I have had many requests for this in the past and it’s about time I made a video for it. I’m also going to show you a slightly simplified version also if you’re finding what Dom plays a little tricky. The above example shows what Dominic Howard actually plays at 0:29 into the song. The drum fill consists of 16th note triplets. Each beat of the bar is split up into six evenly spaced notes and then subdivided even further into two groups of three. Each group of three is played the same, R L F.
As you can see, the hands alternate between the snare drum drum and the tom toms. The fill ends with a single snare drum note on the + of beat 4. The hi-hat foot is stepped on all of the eighth notes. This means that the bass drum foot is being played just before each downbeat and just before each left hi-hat foot. Here we see the simplified version of the drum fill which is exactly the same as the way Dom plays it except the hi-hat foot has been omitted. The hi-hat foot really isn’t essential to the feel of this drum fill and so can be left out if proving too hard to include. 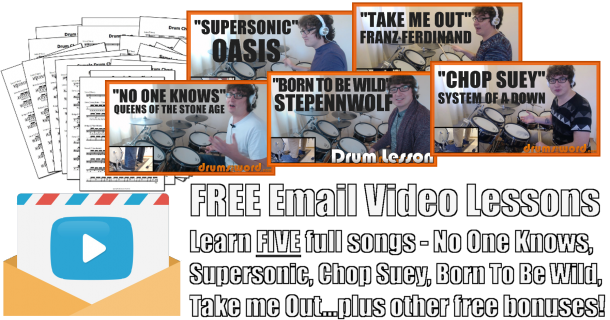 As always, email me if you have any questions and happy drumming to you!